Every Spring, for the last few years, my friend Molly has tasked me with helping her create a photograph of the kids in her son’s class. We have always tried for a heart shaped grouping… sounds so simple, right? The first couple of years were hysterical because the kids were so little… we tried to line them up head to toe and I was to take a photo from above them. It was absolutely an exercise in herding cats. This last year, Molly and I had rescheduled for the umpteenth time and we finally got a dry but cold grey day with a brisk breeze. 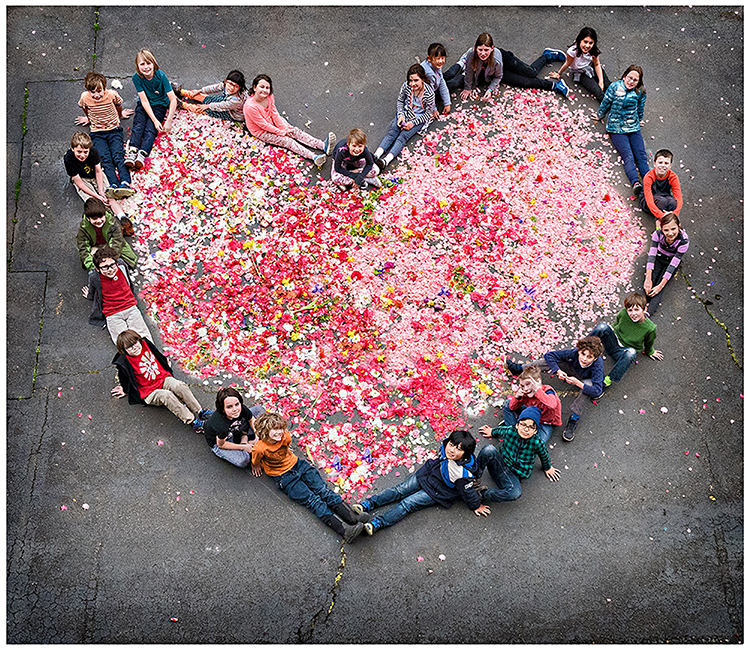 I met her at the school… she chalked out the heart shape on the edge of the playground and then hauled buckets and buckets of flower petals that she had collected up to the chalk line. We had the kids line up on the chalk and then tossed in this riot of color and textures… the breeze enough to keep it exciting. As they were fluffing the flower petals, I climbed the worn stairs to the second floor to a just emptied classroom. The windows were high and hinged outwards so I grabbed a stool and leaned out as far as I could, trying to clear the big concrete sill and the edge of the glass. Luckily, I was working with my Lumix so I could hold the camera out level and still use the tilt screen for framing and focus. All that planning paid off and the flowers scattered in the Spring breeze. This entry was posted in Day to Day, Kids and tagged Bosworth Studio, chalk line, flower petals, herding cats, little kids, muddy shoes, Portland photographer, school auction on March 1, 2018 by admin.